A high quality brush can last many times longer than a poorly made one, so many artists consider it a worthwhile investment to spring for brushes that won’t need to be replaced every other week. But no brush is invincible, and far too many of us have developed some bad habits that shorten the lives of our brushes. 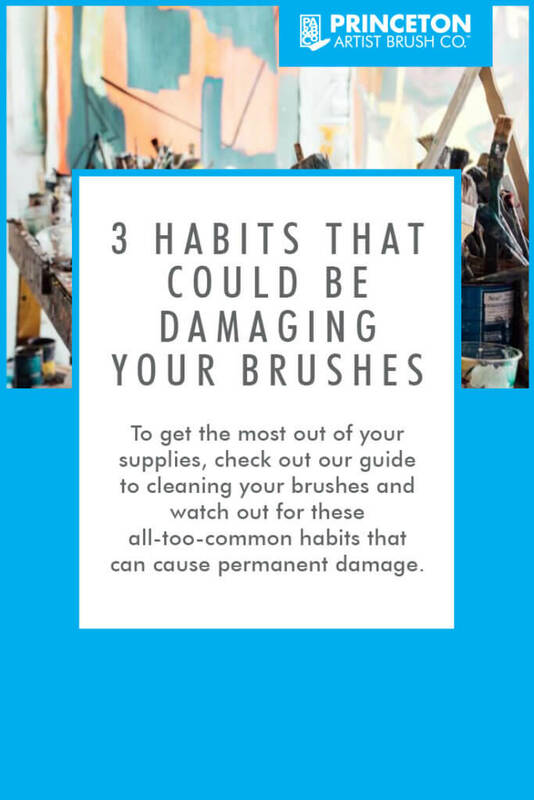 To get the most out of your supplies, check out our guide to cleaning your brushes and watch out for these all-too-common habits that can cause permanent damage. As relaxing as a long session of painting can be, it can also take a lot out of you. 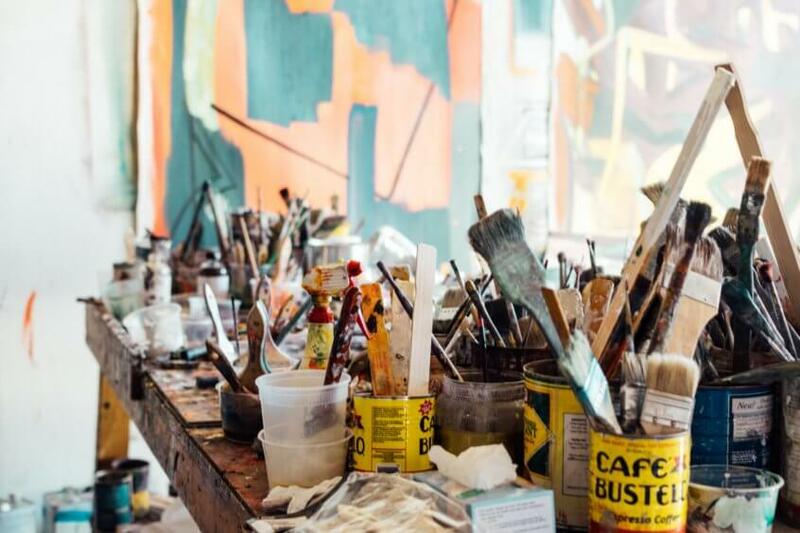 If you’ve just spent the day pouring your creativity and passion onto a canvas, you’re probably going to cringe a little when you look at the row of paint-covered brushes that still need to be cleaned. It’s important not to put it off, though. Once any paint dries on a brush, even a thorough cleaning can leave small particles behind that lodge themselves in between the bristles and work their way down to the ferrule. This will build up over time and start to wedge apart the bristles, twisting the shape and creating gaps for even more paint to build up until the problem snowballs and the your favorite brush ends up clumping into separate pieces. Always wash your brushes immediately after using them. We all procrastinate sometimes but this should be a golden rule of your painting sessions if you want your brushes to stay healthy. Remember that some paints dry a lot faster than others. Oil paint will give you a little more leeway but you have to move fast with acrylics. For especially long painting sessions, it’s a good idea to take regular breaks to give your brushes a thorough rinsing. Soaking your brushes in water or mineral oils can be a quick and effective way to clean out any stubborn paint. If you’ve read our guide you’ll already know that you don’t want to keep them soaking for too long, but that’s not the only thing you need to watch out for. Keeping water and solvents away from the crimp and handle of a brush is a good habit, so you definitely don’t want them submerged. That could cause any glue to erode and a swelling handle will loosen the crimp’s grip. If it gets bad enough you’ll end up shedding bristles across your canvas. Keep the water just deep enough to cover the bristles but not so deep that the entire ferrule is soaking. It might also be tempting to use steaming hot water when cleaning out tough paint, but high temperatures will wear out your brushes quickly. Consider investing in a brush-holder that suspends brushes and keeps their weight off the bristles while they soak. Once you’ve finished cleaning your brushes, there are still a few important things to keep in mind before you start packing away supplies for the day. If you store your brushes vertically, always keep them bristle-side-up. But beware – if water is still trapped in the bristles when you stand it upright, it could flow under the ferrule where it won’t soon evaporate. This can turn into a big problem if water makes it way to the crimp, where it can slowly wear away the glue and cause the base of the handle to swell. Moisture can also build up quickly when you store damp brushes in a case or closed drawer, so give them a chance to dry out in open air whenever you can. If you transport damp brushes between sessions, be sure air out the case when you have a chance.